A few more details have come out about Michael Crichton’s new novel Micro. I’m looking forward to seeing that bibliography. The last four novels Crichton published while he was still living—Next, State of Fear, Prey, and Timeline—all had bibliographies. I missed seeing one in Pirate Latitudes. The subject of the tension between modern man and the natural world was one to which Crichton repeatedly returned throughout his career. In an unfinished introduction to MICRO, he wrote, "Perhaps the single most important lesson to be learned by direct experience is that the natural world, with all its elements and interconnections, represents a complex system and therefore we cannot understand it and we cannot predict its behavior...Interacting with the natural world, we are denied certainty. And always will be." Reading the first new words from Crichton since Pirate Latitudes put a lump in my throat. I hope the introduction will be published with Micro, even if it is unfinished. I hope Richard Preston writes an introduction or appendix that describes in detail the process he went through in finishing the novel: how he research through Michael Crichton's notes and deciphered his intention for the completion of the story. 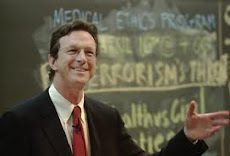 As a fan I'd also LOVE to see a big book or website/CD-ROM called something like 'The complete notebooks of Michael Crichton', which would catalog all his most interesting notes on his novels, and include as much detail as possible on other unfinished works.